"Modernity, Complex Societies and the Alphorn"
"On Swissness in Alphorn Performance"
"Representing Wenger (maker of Swiss Army Knives) in Las Vegas"
William Hopson's CD "All is Well in the Valley"
"The Pleasure of a New Discovery"
"Fans Get Lucky at Music in Mountain Show"
This is an interesting video report on the Alphorn and it's place in the modern world. There are interviews with Hans-Jürg Sommer, Emil Frei, Gilbert Kolly, William Hopson and many others. There are also Alphorn players playing in different styles and in different settings. At the end William Hopson performs his "Luzärner Hinterlander" melody in full. The video is long (56 minutes), but it is an excellent introduction to the Alphorn in modern Switzerland. Ms. Vignau is currently expanding her thesis into a book about the Alphorn and this video is intended as an introduction to the book as well. Ms. Vignau has kindly allowed it to be available on YouTube until the final version is published. Out of respect for the copyright priviledges of the author we cannot publish this fine article here in its entirety. Ms. Vignau is an ethnomusicologist and a keen observer of the Alphorn. She has much to say about Swiss authenticity in Alphorn performance today. 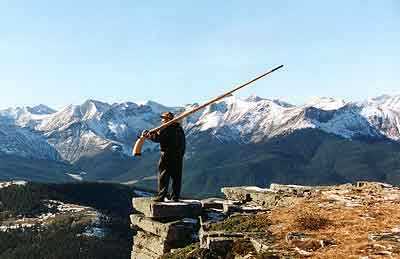 There is much here about the original Swiss style of Alphorn playing from the alpine regions, the shepherd and cowherds that are the basis of that tradition, and the importance of expressive freedom, naturalism and landscape in the ideal of Alphorn blowing. This article is highly recommended. To read the entire article click on On Swissness in Alphorn Performance and scroll down to page 57. The third part of this article, "Imagine Being a Shepherd - on Authenticity", discusses the direction of the alpine style of Alphorn playing. The important Swiss Alphorn blowers Hans-Jürg Sommer, Emil Frei and Gilbert Kolly describe William Hopson's approach to the Alphorn and his position in the Swiss Alphorn community with regard to the question of "Swissness". To read this part of the article click on (same link as above) Imagine Being a Shepherd - On Authenticity and scroll down to page 65. On February 1st to February 3rd, 2008, William Hopson played the "Shot Show" at the Convention Center in Las Vegas, adding a strong element of Swiss culture to the Wenger Exhibition at the show. Wenger is the maker of genuine Swiss Army Knives since 1893. The "Shot Show" is an annual exhibition of hunting and outdoor equipment - the largest such exhibition in the United States. The Wenger exhibition was very popular throughout the show, and a good time was had by all. The highlight of the show was the introduction of a new Wenger knife that is a recreation of the first Wenger Swiss Army Knife. The people representing Wenger are very proud of their knives, watches, shoes, and all of the other gear that they manufacture and sell. The first time I played an Alphorn was in 1977. I had just arrived in Calgary, fresh from Oberlin Conservatory, to play Horn in the Calgary Philharmonic Orchestra. 28 years later I still love playing Horn in the CPO, but I realize that my main contribution to music is in the Alphorn world. Indeed, about half of my living is now made from Alphorn related activities, and half of every summer I spend in Switzerland teaching at the Swiss Alphorn School and just hanging out with my equally Alphorn-obsessed Swiss friends. Going back to my first Alphorn experience those many years ago, I think it was the sound that first grabbed my attention: Big like a Tuba but with the mellow sound of wood. The length and beauty of the instrument was the next attraction. I couldn’t sleep that night thinking of the possibilities. I was Alphorn crazy from the beginning. But after ten years of playing Alphorn in Canada, I was becoming frustrated. 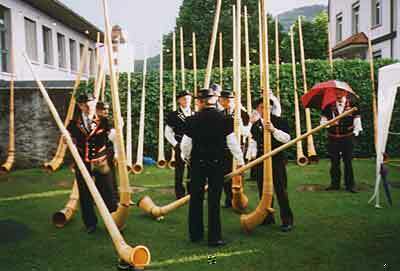 I had three Swiss-made Alphorns at that time, but my first public Alphorn performances were disappointing. There were intonation problems with the Alphorns, and high notes that didn’t quite speak. The Swiss mouthpieces in those days had wide rims – twice the thickness of Horn mouthpieces. It was like my lips were stuck in cement. Thus began Rocky Mountain Alphorns - as a mouthpiece making experiment in my woodshop. Shortly thereafter I was making Alphorns, although it took me several years to make a good one. Since 1992 I’ve been making and selling 8 Alphorns per year. In 2005 my career production reached 104. My Alphorns are made from Sitka Spruce from Vancouver Island, and I use various beautiful hardwoods from all over the world for the trim. As an option, I have an artist friend who can add his special carved and painted artwork to any Alphorn. Along the way, I’ve produced four eclectic Alphorn cds and one volume of expressive Alphorn melodies. I’ve performed countless Alphorn programs in such exotic places as Croatia, Prague, Madrid, Kazakhstan and Kalispell. I’ve been fortunate to perform the “Concerto for Alphorn and Orchestra” by Swiss composer Jean Daetwyler with many orchestras; it is by far the best Alphorn piece ever written. My personal performance highlight was performing an encore version of this concerto with my Calgary Philharmonic in six cities on our European tour in 2000, including Innsbruck, Zürich (at the Tönhalle), Geneva and Basel. Of course, all of these things were easy compared to learning to speak Swiss-German. By far my greatest pleasure has been watching the development of Swiss Alphorn playing over the years, and hopefully making something of my own contribution to that art. When I arrived on the Swiss Alphorn festival scene in 1995, the amateur players were dominated by a rigid set of rules that limited the expressive possibilities of the instrument: No vibrato, no trills, no glissandi, no short notes, no fast notes, no show-off techniques and above all, limited use of the miscreant (and supposedly out-of-tune) 7th and 11th partials. The overall level of Swiss Alphorn playing was high, but those brave souls who broke the rules had been given a pretty rough ride. Of course, I knew nothing of the rules and proceeded to break every one of them on a regular basis - and never stopped. Probably the only thing that saved me was that I was Canadian and I smiled a lot. Ultimately, the progressive Swiss players took heart and the people started to like what they were hearing. The 7th and 11th partials found their proper (and prominent) places in the tonal palette of Alphorn music. 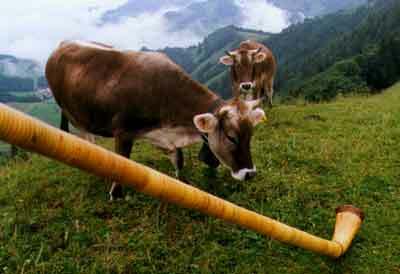 Along the way I’ve made a lot of friends and become pretty well known in the Swiss Alphorn community. Nowadays there are only a few enclaves of conservatism, and interesting music by composers like Hans-Jürg Sommer is played regularly in the festivals. The Swiss Alphorn makers have made great progress as well. The current generation of Alphorn makers is making excellent instruments. If any of you want to experience Swiss culture from the inside, you should visit one of the Swiss festivals. The people are friendly, the beer is cold, and the party goes all night. The Swiss tradition is that the last Alphorn player to go to bed on Saturday night wakes up the first Alphorn player to play on Sunday morning – literally “Alphorn around the Klock”. Better yet – join us at the Swiss Alphorn School. If you don’t have an Alphorn you can rent one. There is a good description of the School on my Rocky Mountain Alphorns website at www.alphorn.ca. Of course, if any of you want to buy an Alphorn or an Alphorn cd, my website is a good place to begin. If you have any further questions, you can email me at hopson@alphorn.ca. In the summer of 2005, I traveled to Switzerland with my friends in the Jodlerklub Heimattreu to participate in the Eidgenossisches Festspiel (the National Festival) in Aarau. The festival was from June 17 to June 19. This was a huge festival (which is held every three or four years) and thousands of Jodlers, Alphorn blowers and flag throwers participated. I performed at the festival as an Alphorn soloist and with my Rocky Mountain Alphorn trio. I was quite impressed by the Alphorn blowing that I heard at the festival. Over the many years that I have been visiting Switzerland and attending the festivals the quality of the playing that I have heard has steadily improved. In particular, I found the musicality and the creativity of the best Swiss Alphorn blowers wonderful to hear. I think that for many players, some of the old rules, which were very restrictive, have been reconsidered. The best of the Alphorn tradition is still maintained, but new ideas are everywhere to be heard. I even heard a bit a jazz Alphorn, which was most refreshing - and I heard it played IN the festival - not just after the festival as if it were somehow not legitimate. Bravo to all of the participants! As to my own performance at the festival, I will leave all commentary to the Alphorn jury, which is shown just below. After the festival, I traveled with my Jodlerklub friends for a week, and then visited my Swiss friends until it was time to take up my teaching duties at the Swiss Alphorn School. Tonal Expression: It made an exceptional effect; an attractive and balanced tone which radiates in every register. Blowing Technique: His legendary control was masterful. It was very flexible and acrobatic; in fact, it is an agility to be envied. The pitch was exacting and was always flawlessly maintained. Interpretation I: It was contrasting and sophisticated; offering a strongly expressive characterization with it own fascination and charisma. The final phrase of the melody was a masterpiece of dynamics. The phrasing was clearly structured and captivatingly played. This demanding melody was multidimensional and featured articulations that were adroitly played. Interpretation II: The meter and the rhythm were always fascinating and striking. We enjoyed the pacing and the various tempo changes. Musical Expression: This performance was a real treat to the ears. The Alphorn blower, William, in playing it, was rewarded with wild applause. Remarks: This was truly musicianship: A joy for listeners and jury. The Alphorn gathering at the Northwest Swiss Jodel Festival demonstrated that the Alphorn is not purely a Swiss affair. 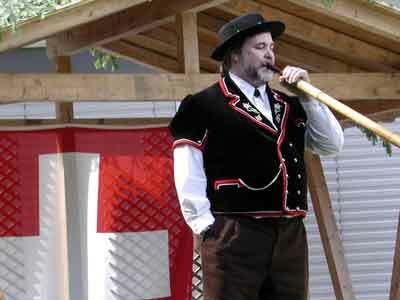 Canadians can also play the Alphorn - at least this one Canadian - his name is William Hopson and he comes from Calgary. It took a Canadian traveling all the way to Switzerland to explain to this native Swiss layman the true origin and meaning of the Alphorn in Swiss tradition. The Alphorn shared an origin with the "Chumm ssae ssae!" [Editor’s note: The "Chumm ssae ssae!" is a loud cry that is still used by farmers in some regions of Switzerland to call their cattle back to the barn. It is a part of their working day. Why they use these words is unknown. A best guess is that it means “come to the house” in an old Bernese dialect.] Both the "Chumm ssae ssae!" and the sounding of the Alphorn originated as a way for the alpine herdsmen to call their animals back to the barn in the evening,” explained the Canadian, William Hopson, after his performance this weekend at the Northwest Swiss Jodel Festival in Grenchen. 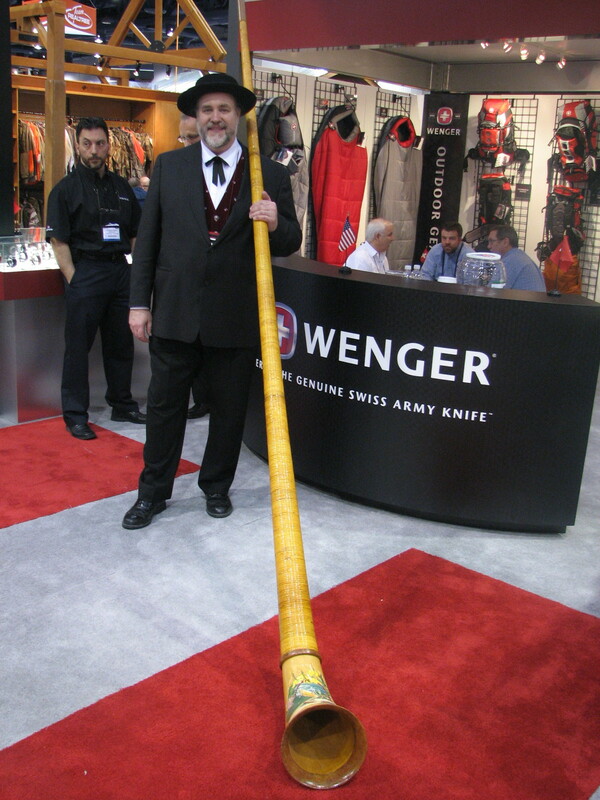 Proudly the fifty-year-old reveals his Alphorn, which he has made out of Canadian Spruce. The Alphorn is trimmed with Australian Jarra Wood highlights, and is carved with folkloric scenes which further describe the origin of the Alphorn. William Hopson not only plays the Alphorn, he builds them and he teaches the instrument at an Alphorn school in Schönried. In answer to the obvious question of his family roots, Hopson replies that he has no Swiss ancestry. Musical roots he does have, however. Hopson is a professional French Horn player in the "Calgary Philharmonic Orchestra". He first experienced the Alphorn twenty-five years ago when he was introduced to it by German friends in Calgary. Hopson clearly loves playing the Alphorn: "It is the wonderful sound that I love. I also enjoy playing it with the orchestra when I can. I admire the Swiss for maintaining their folklore and their traditions. The Alphorn is still so important in Switzerland today. Such an awareness of tradition does not exist in Canada or in North America,” says Hopson with regret. Hearing him speak, it is not surprising that Hopson is a member of the “Jodlerklub Heimattreu” [Yodel Club “True to the Homeland”] in his hometown Calgary, an organization which is in the Schweizer Jodler Verband [Swiss Federation of Yodel Clubs]. Calgary is in the foothills of the “Rocky Mountains”, and here Hopson finds himself on the frontier of Alphorn culture. “I must constantly explain myself when I play Alphorn in Canada. The people don’t know anything about the instrument, or where it comes from,” says Hopson. When he played on Saturday in Grenchen, Hopson did not have to explain himself - well maybe a bit when he played a cadenza with notes that are not ordinarily attempted by the players here. "Okay, that was not traditionally played", laughed Hopson, admitting that he sometimes enjoys playing blues and jazz on the Alphorn. However, he is clearly a fan of all things Swiss, and he is quick to point out that the traditional melodies that the Swiss people hold dear are his favorite to play. The people in Grenchen enjoy that as well. If anyone is interested in attending an Alphorn course with William Hopson, the dates for the Swiss Alphorn School are July 11-17 and 23-25 in Schönried. There is more information on the internet at www.alphorn.ca/. 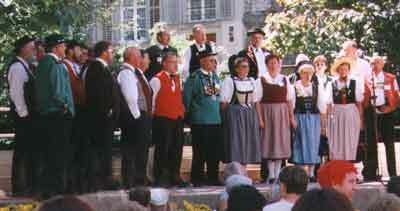 On July 5th to 7th (2002) William Hopson attended the Eidgenössicher Jodlerfest in Fribourg (Switzerland). He was there with his fellow Jodlerklub Heimattreu members from Calgary. He played in the Alphorn Solo and Trio competition, the latter with his Alphorn partners Fritz and Sonja Weidmann. He received a first class ranking in the Solo competition. There were some 700 Alphorn blowers at the competition, and thousands of Jodlers and Flag throwers. Of course, the main reason he was there was to see his Swiss friends, to participate in the all night party on Saturday night (Alphorn blowing and Jodling in the ancient streets), and possibly to drink a few beers. As a part of the Saturday night festivities, Hopson was a participant in the creation of a new Guiness world's record for the largest Alphorn ensemble: 248 Alphorn blowers. The previous record was 246. 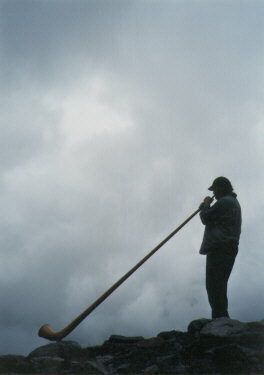 There was some initial concern that the record could not be set when only 220 or so Alphorn blowers made it to the top of the Fribourg cliff (the site of the gathering). However, some quick thinking Alphorn blowers got on their cell phones to the local bars to turn out enough Alphorn blowers with sufficient sobriety to make the climb. After this exhausting regimen he spent a week traveling and recovering his health in Switzerland with his Jodel club friends. After a fine week the Jodler club members all went their separate ways, and Hopson continued to tour Switzerland, including visits to Bernatone Alphorn maker Arnold von Allmen's chalet near Davos. Last but not least, while visiting the Waldhüsli (little forest house) of his friends Andrea Freimel and Werni Donath, he fulfilled a lifelong dream when he milked a cow. William Hopson's CD: "All is Well in the Valley"
........The solo, chamber, and orchestral literature for the horn draw from medieval chant, folk melodies, and many other sources to make our repertoire extremely rich and varied. The alphorn and its prominent use of Swiss folk tunes and melodies has been an important contributing part of this literature, probably the best known being the one used by Brahms in the fourth movement of his first symphony. In November of 2000 the Calgary Philharmonic Orchestra enjoyed a successful twelve-city tour of Central Europe. The orchestra was led by Music Director Hans Graf, who is now the Music Director of the Houston Symphony as well. The tour took the orchestra through a part of the world that is renowned for its musical sophistication. The CPO performed concerts in Austria (including the Musikverein in Vienna), Germany, Switzerland (including the Tonhalle in Zurich) and France. In addition to playing my orchestral horn throughout this tour, I was featured in a six minute excerpt from the "Concerto for Alphorn and Orchestra" by Jean Daetwyler as an encore to seven of these concerts, including the concerts in Innsbuck (the Kongresshalle), Montreux (Auditorium Stravinsky), Biel / Bienne, (Biel Centre CTS), St. Gallen (the Tonhalle), Zurich (the Tonhalle), Basel (the Casino) and Geneva (Victoria Hall). The sentimentality of Daetwyler's music was well chosen for the Swiss (and Tirolian) audiences, and I appreciated the many curtain calls and enthusiastic reviews that I received throughout the tour. Perhaps there was also an element of surprise that a Canadian orchestra would bring a Canadian Alphornist (playing a Canadian-made Alphorn) to the front of a concert stage in Switzerland. Following are excerpts from reviews of my Alphorn encore during the tour, as well as commentary from Bob Clark, a columnist in the Calgary Herald who travelled with the orchestra to publish a daily report on the progress of the tour. The German translations are by Claus Diedrich of the German Language Service, Calgary. For an encore the orchestra also played an excerpt from the Alphorn Concerto by the composer from the Vallais, Jean Daetwyler, performed by the orchestra's own horn player, on a dazzling [original German: prächtigen] instrument of his own make. Seemingly unending applause lead to three encores; one of which a spectacular coup surprise: Jean Daetwyler's Music for Alphorn and Orchestra, the solo voice blown on the Alphorn by a Canadian in traditional Appenzeller costume. A swiss alphorn in the Maestro concerts? Whoever thought this impossible learned differently Wednesday evening in the Innsbruck Congresshall. The CPO bewitched the audience with the thrilling encore after an exhausting program. The overall well-deserved applause was followed by two encores, the second of which was something very special: An excerpt of a concerto for Alphorn (!) and orchestra, performed in an impressive manner by one of the orchestra's own horn players who crafts Alphorns in his spare time. ....the orchestra held yet another special surprise: An Alphorn player in Swiss costume, fresh from the Rocky Mountains. In an outstanding performance with full and gentle tones, he rendered a movement from Jean Daetwyler's Alphorn Concerto, together with Fribourg's Ranz de Vaches. Naturally, this Hommage á la Suisse sent the audience into raptures. .....the orchestra was rewarded with three encores, one of which featured CPO hornist Bill Hopson playing excerpts from a well-known Swiss alphorn concerto on the three-metre-long wooden instrument that he had made. Hopson's solo appearance has become a certified crowd pleaser. "I had a lot of friends in the audience," Hopson said afterward. "In fact, I was given a membership in an alphorn trio from Montreux that this summer, with me, will become an alphorn quartet. Also, the family of Jean Daetwyler (the alphorn concerto's composer) was here so that, for me at least, it was a friendly audience in a friendly hall." "I thought the alphorn really filled this hall. It was very reverberant." Hopson said that much of the reason for the instrument's appeal with Swiss audiences is the fact that the alphorn has become so closely identified with the country over its long history. "There's a Roman bath that they've excavated above the lake of Geneva, that has tiles depicting what looks like an alphorn," Hopson said. "And that dates the instrument back to at least A. D. 160." He pointed out that many older Swiss people spent a greater part of their lives on farms before moving into cities such as Montreux, and for them the alphorn evokes strong memories of an often spectacular landscape. One older member of the audience was seen removing his hearing aid and cupping both hands behind his ears as he leaned forward to better hear Hopson's performance. If the genial Hopson was nervous about performing he didn't show it. "You get anxious a bit, but I'm past nervousness," Hopson said, laughing. "Over a long career, my adrenal gland has lived a full life - and died.". ......I went to see the Calgary Philharmonic play at Geneva's Victoria Hall. It was all really excellent, but the best was their "encore" where they had a big burly man with a beard and ponytail from Calgary who played the Alp horn. Fantastic. He was wearing a red Appenzeller jacket and carried his Alp horn over his shoulder. The best was when the violin section all had to tinkle small cow bells as occasional background noise. The audience came to within a hair of breaking up, but managed to pull themselves collectively together. Yes, anyway, I was most cheered by your orchestra - the conductor was first-rate, and there was a refreshing attitude that I really appreciated (I'm talking about those little cow bells). European orchestras can be so stuffy, old and complicated. There is a difference. Participants also formed into Alphorn ensembles for practical experience. It was a fine group of Alphorn blowers. Much was learned about the Alphorn and many friendships were made. In the summer of 1999 I had a five week tour of Europe, with concerts in Zurich, Gstaad, Mürren and Frauenfeld (in Switzerland), Versailles, Paris, Munich and Croatia. I had a wonderful time. During my stay in Munich I was hosted by Hans Menzinger of Trachten-Poellmann. I had high expectations for the cultural attractions of the city. In this I was not disappointed, but it was the beer gardens, with good food and hearty brew, that impressed me most about the comfortable life style of the Bavarians. We had a wonderful day driving out to the country to visit the Ammertaler Verein clubhouse for an evening of Schuhplattler dancing, whip-cracking, Bratwurst and the inevitable bottomless stein of beer. The Ammentaler Alphorn blowers took time away from the festivities to sound a few Bavarian melodies. Then I was off to France for concerts for Alphorn and Organ in Paris and Versailles. These concerts were arranged by my friend Daniel Borgue. With Daniel as my guide I saw as much of Paris as one can see in five days. He should know Paris; he was Principal Horn in the Paris Opera for many years. We took a day to tour Versailles, the fashionable castle of Louis XIV (the Sun King), whose Bourbon dynasty set the style for European opulence in the 17th and 18 centuries. Louis XIV was fanatical about the hunt. Versailles began as a hunting chateau. The tour of gave me an opportunity to get in touch with the origin of the other horn in my life; the one made of brass. The Alphorn has a small but dedicated following in France. For the concerts I was ably assisted by Madame Cabannes (Organ), her son Renan (Flute and Horn) and the Horns of Versailles, led by Daniel Borgue. I performed several fine pieces for Alphorn and Organ by French composer Charles Conord. Daniel also joined me for an Alphorn duet by Hans-Juerg Sommer. I was greeted in Gstaad by my Alphorn blowing friends Fritz Frautschi and Daniel Dube. Gstaad is a resort village nestled deep in a valley surrounded by the towering mountains of the Berner Oberland. The weather was beautiful and the alpine flowers were in bloom, so I had a pleasant day-long hike to Gsteig. Thanks to Daniel I had the good fortune to be introduced to Ernst Oberli, an Alphorn maker of great renown. 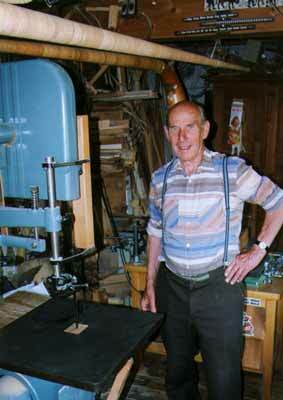 Ernst is still making fine Alphorns, although he is approaching ninety years of age. I blew my horn for him and he gave me a tour of his tiny workshop. For me it was a treasured connection to the Swiss Alphorn tradition. Sierre was the home of Swiss composer Jean Daetwyler. Daetwyler died in 1994, but I was met by my friends Antoine and Chantal at the train station in Sierre. Chantal is the daughter of Jean Daetwyler. I also met Pym, the grandson of Jean Daetwyler. I had only three days in Sierre but we made the most of them. I visited the peaceful home (in a vinyard) where he composed his "Concerto for Alphorn and Orchestra", which I have had the pleasure to perform many times. I saw the wooden masque that inspired the "Totentanz" movement in his concerto. Antoine played the organ in the church where Daetwyler composed his "Suite Montagnarde", which is another of my favourite pieces. The people in the Rhone Valley are justly proud of the music of Jean Daetwyler. You can hear the strong voice of their culture in his music. I am happy to say that I left Sierre with my pack filled with music by Jean Daetwyler for future performance. We also had a day of hiking in the Alps of French Switzerland, to a mountain hut just one valley to the east of the Matterhorn. My next stop in my European journey was in Switzerland to attend the National Festival in Frauenfeld, Switzerland. The festival (called in Switzerland the Eidgenoessisches Jodlerfest) is an enormous gathering held every three or four years to celebrate the traditional arts of Jodelling, Alphorn and Buchel blowing, and flag throwing. I was fortunate to be the guest of my friends Paul and Hedi Roth of Addliswil. Paul was the organizer of the Alphorn competition in Frauenfeld and is, himself, a very fine player. He must know every Alphorn blower in the country. I am, at this time, the only native North American that has been invited to participated in the Alphorn competition at the Swiss National Festival. I have many good friends among the Swiss Alphorn blowing community, and in my several visits I have always been treated in the most gracious manner imaginable. The Swiss Alphorn community is currently engaged in a spirited (and civilized) debate over the definition of Alphorn tradition and the direction of their national style. As I listened carefully to many of the Alphorn performances in Frauenfeld, I was particularly gratified to note that many Swiss Alphorn blowers are moving beyond the strict limitations of their "modern" school. From my very first visit to Switzerland I have on occasion been informed that so much of what I find beautiful and engaging about the Alphorn is "not allowed". Techniques that I found comfortable on the Alphorn were "impossible". I have also been warned that "you must never change a note in a traditional melody" and told that "the Alphorn is not for professional musicians". The natural scale of the Alphorn has several exotic notes (in notation, b, f and high a) that are pitched differently than mainstream instruments. Many of us choose to feature these fascinating notes in our compositions, but influential Swiss teachers preach avoidance, or at best to hide these notes in a passing scale. Many times I have been told that I use too many of "the strange notes". The Alphorn is a shepherds' instrument, and to my mind that implies a value to individuality and a wide freedom of musical expression. A thoughtful study of A. L. Gassmann's scholarly collection of ancient Alphorn melodies reveals that, in former times, such expressive lattitude was not only tolerated, but encouraged. It is clear that, in the shepherd tradition, the "exotic" notes were used freely. However, I cannot avoid the feeling that many of the melodies in the Gassmann collection, if they were written today, would be rejected by some as "too modern". In Frauenfeld it was evident that increasing numbers of Alphorn blowers share my views, especially among the younger players. The freedoms of the ancient shepherd tradition are being re-examined and adopted. The wonderful music of contemporary composer Hans-Juerg Sommer was chosen by 81 of the competitors in Frauenfeld; the most for any composer. A fresh wind is in our sails. All of the rules of natural phrasing that apply to the music of Mozart can be equally applied to the music of the Alphorn. Two years ago I participated in two Alphorn competitions in Switzerland. In one week my reception ranged from showers of accolades at the Berner Kantonal Festival (see the Berner Zeitung article and the Alphorn Jury report) to an abject disqualification from the conservative jury at the festival in Sempach. This latter judgement came despite the large and enthusiastic crowd attending my performance, and was intended as a rebuke to my "reformist" principals. I received the disqualification with curiosity and some amusement. This summer I was still getting requests for my 1997 competition piece, which was my own variations on "Moos Ruef" by Hans-Juerg Sommer. I performed in Frauenfeld this year with a better understanding of the factional debate, although this has in no way softened my approach. I speak of factional debate, but perhaps a better choice of words is fraternal discussion. The good news is that there were so many talented young Alphorn blowers participating in the Frauenfeld gathering. Much credit for this goes to teachers with views that differ from mine. I honour their effort and their dedication to the art of blowing the Alphorn. I value their friendship. We all serve the same master. The music that I chose for my Frauenfeld performance was my newest Alphorn composition, "Shepherd's Song from Delirium Valley". For my effort I received a "Klasse 1" ranking and some wonderful compliments in the Alphorn Jury Report. Getting that over with early, I could meet with my old friends and enjoy all of the wonderful festival activities. There were 403 Alphorn blowers in Frauenfeld for the festival, and jodelers beyond count. I was attending the festival with my Swiss-Canadian friends in the Jodlerklub Heimattreu of Calgary. I was proud of their performance at the festival, which earned a high ranking among the many choirs present. The fact that we came from such a great distance was much appreciated by the other clubs. The festival was a very intense and interesting experience, and we enjoyed every minute of it. The Swiss are very passionate about their culture. The street scenes are amazing. Good food, steady drink and a shared sense of comraderie fuel the groups of Jodlers, Alphorn blowers and flag throwers, who demonstrate their art on any open ground. The tradition among Alphorn blowers is to avoid sleep during the festival: The last to fall into bed wakes up the first to play each morning. Alphorn around the clock. This festival is not for the faint of heart. The Saturday night that I spent in a courtyard cafe with Swiss composer (and fellow Alphorn iconoclast) Hans-Juerg Sommer was one for the ages. We spent the early morning hours sharing melodies and drinking wine with the aptly named Engel Choerli (Choir of Angels) of Appenzell. Their traditional Naturjodel was bourne from heaven on a gentle breeze. It was quietly thrilling, in a way that is unlike any music that I have ever experienced. All of which made their sudden transition to 50's and 60's classic rock and pop tunes, sung in their inimitable jodel style, all the more effective. These are versatile musicians of the first order. After the festival I travelled for a week in Switzerland with my good friends from the JodelKlub Heimattreu. We had good food, song and strong drink in many wonderful places. I particularly remember the duet (for Alphorn and Flag Thrower) that I played in the Kloental, and my friend Suzi's tiny four hundred year old home above Elm. It is called "Waldhausli" (little forest home). Thank you to all of my good friends in Europe for your hospitality. It is so much easier to arrive in an unknown city with such wonderful people to greet me. Music: "Shepherds' Melody from Delirium Valley"
Musical Impression: A strongly individual musical expression, full of drama, sensitivity and deep feeling. Remarks: A melody with all that you can ask for, from the highest to the deepest tones, and all perfectly interpreted. 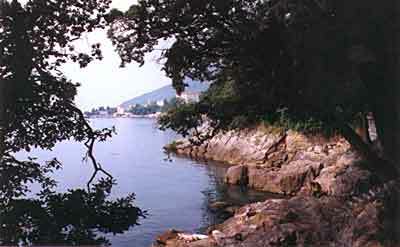 In July of 1999, as a part of a European tour, I performed three concerts in Croatia as a guest of the Music Academy Ino Mirkovitch in Lovran, Croatia. While in Croatia I stayed in Villa Frappart, on the sun drenched shores of the Adriatic Sea. Villa Frappart is certainly one of the most beautiful private homes in the world. This is the area around Opatija, which offers a mild climate, a coastline of alternating rocky pools and sandy beaches, miles of well kept tourist promenades, and a friendly and helpful populace. I give it my highest recommendation as a place to visit for healthful relaxation, for swimming in the inviting salt water sea, and for the exploration of castles and ancient ruins. Following is a review from my performance of Alphorn and Organ music at the Lubenice Festival on the Island of Cres in Croatia. 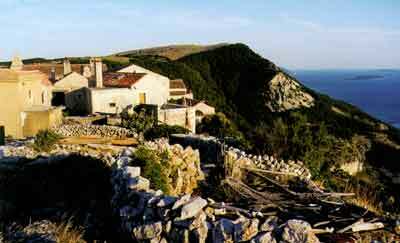 Lubenice is an ancient stone village clinging to the sheer edge of a cliff overlooking the blue of the Adriatic Sea. It is a blue that is beyond my descriptive powers, but is forever etched in my memory. Everything about Lubenice whispers memories of ancient peoples and verifies the permanence of stone. Here the land is arid. Not much more than a few scrub trees and the tall brown grass that sustains the sheep that wander the hills below the village. Walking throught this flock of sheep to my dressing room, I could only marvel at my luck. The Alphorn is a shepherd's instrument, and this encounter with the sheep only added to a perfect experience. William Hopson is one of the few composers and artists that are exploring the full technical and interpretative possibilities of the alp horn. "This is the best concert of my life!" Those were the words chosen by alp hornist William Hopson as a farewell to the audience gathered at the square in Lubenice after his concert, which was held on Friday, the 16 of July. The concert itself took place in St. Mary's Church. However, both before the event and as an encore Hopson played a few traditional Swiss melodies on the square outside the church. It was here that he revealed many details about himself and his unusual instrument to curious audience members, making this extraordinary musical evening complete. William Hopson has been a brass hornist in the Calgary Philharmonic Orchestra since 1977. He has been playing the alp horn since he first encountered the instrument some twenty years ago. The alp horn is a symbol of loneliness. For almost two thousand years it has been a pastime of the shepherds in the Alps. 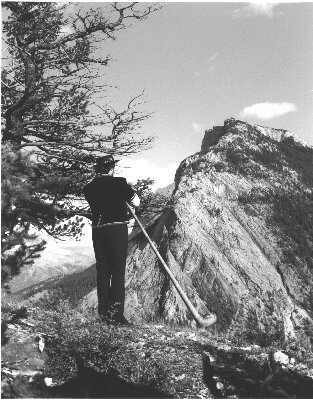 It was often the young boys who carved the Alphorn from wood. Far from their families and homes, the shepherds blew their horns while their flocks grazed in alpine meadows. Hopson plays the traditional Swiss music, but as well he performs compositions created by contemporary Swiss composers specially for the alp horn. In addition, Hopson is well known as a builder of this instrument, handcrafting about ten horns per year. Over the years he has used forty-two different kinds of wood in making his horns. The instrument he played for the concert in Lubenice was made from Canadian Spruce, Mexican Bacote and Vietnamese Rosewood. The concert began with the "Alphorn Ballade", written by Dennis Armitage in 1928. It rolls along in a slow waltzer rhythm. This piece was followed by "Suite Pastorale" in which composer Carl Rutti uses original folksongs from different Swiss localities. With his interpretation of the 2nd Part of Ludwig van Beethoven's no. 1 sonata, pianist Odil Chakirov confirmed his reputation as a perfectionist always searching for the ideal sound color. Later in the concert he revealed this virtue in achieving a perfect harmony with the horn; not only in those compositions where he played "the silent partner" (in the "Alphorn Ballade" and the 1st and 3rd movements of the suite), but also in the humoristic (2nd and 5th ) movements of "Suite Pastorale". The second part of the concert began with "Suite fur Hornvieh", in which composer Hans-Juerg Sommer summons visions of characteristic dancing animals through the lyrical and sometimes gutteral phrases of the alphorn. For the last part of the program, flutist Metod Sironi joined Hopson and Chakirov for "Suite Montagnarde", composed by Jean Deatwyler (1907 - 1994). This demanding piece was influenced by music of many different styles. The three artists performed in harmony and joy. William Hopson describes himself as a quiet revolutionary. He is one of the few composers and performers that are exploring the full technical and interpretative possibilities of the alp horn. With this progressive attitude he is coming into some conflict with those of conservative opinion in Switzerland who hold that only uncomplicated tones and simple melodies should be played on alp horn. Hopson uses the full three-octave harmonic range of his instrument (defined as the natural harmonic scale), and with his playing he demonstrates how the musical possibilities of the alp horn are both varied and interesting. It is very pleasant to listen to the alp horn. Hopson always keeps his melancholic colour, even when he plays in the loudest dynamic. His technique features vibrato, trills, echo effects, wide intervallic leaps and large dynamic contrasts, but through it all he maintains the tender tone characteristic of the alp horn. All of this, in Hopson's hands, makes the alp horn a truly soloistic instrument. Lubenice was an ideal place for this concert. The alp horn is an ancient shepherd's instrument. Lubenice is an ancient shepherd's village. In this concert the people learned much about a new artist and an instrument from a distant land. In this beautiful and ancient setting, this audience experienced something fascinating and original. One player stood out at the 37th Jodlerfest for the Canton Berne. His long hair, tied in a ponytail, reaches beyond his shoulders, his traditional garb is covered with Canadian pins - - and he plays perfect Alphorn. William Hopson lives in Calgary. He has been "hooked" on the Alphorn for 18 years, and he even makes them himself from Canadian wood. He has been a member of a Canadian yodel club for the last twelve years and he also teaches this "instrument of nature". Before his stage appearance he told reporters of the Berner Zeitung, "It is the sound that fascinates me." A large gathering of Alphorn players listened closely on Saturday night to the melodies that Hopson could elicit from his instrument. He amazed his audience with his playing. His performance of his self-composed variations on "Moos Ruef" by Hans-Jürg Sommer was of such a singularly refreshing nature that even the jurors could not hold back a smile. "That is not Alphorn playing as we know it, but it is beautiful what he gets out of our instrument," said Alphorn juryman Hans Gerber from Schüpfen. "Wonderful; music of a very, very high standard," he added in full admiration. Following his performance in Belp, William Hopson will travel in Switzerland for three weeks - - with many melodies in his pocket. He wants to listen to the variations in Alphorn playing in different Swiss mountain valleys, to explore those nuances, and to take that knowledge with him across the Atlantic. The amiable Canadian had been looking forward to his visit to Switzerland for a long time. "A dream comes true," he said with sparkling eyes. Musical Impression: A deeply moving performance of absolutely the highest quality. Remarks: An extraordinary high level which cannot be compared to Swiss capabilities. The wind had a few worried prior to the evening mainstage performance. But true to form for this year, the wind died away to a breeze as the ESO, resident conductor David Hoyt and guest soloist William Hopson took to the stage. Not that there was much danger of Hopson's instrument blowing away. 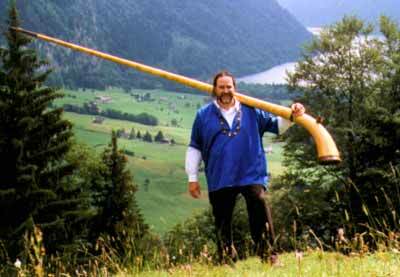 The alphorn is over eleven feet long, and meant to make itself heard in the mountains. Yet Hopson, who makes his alphorns himself when not playing standard horn in the Calgary Philharmonic, showed facets to the instrument many had no idea it had. In both a pre-concert demonstration, and in his performance of Jean Daetwyler's Concerto for Alphorn and Orchestra, Hopson displayed remarkable skill - and not a little amount of sheer lung power - in coaxing tones both mellow and brash, and a three-octave range of pitches from the "two-men-long" horn. 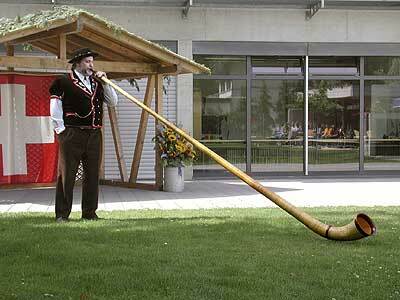 Far from cumbersome, the alphorn was shown by Hopson to be capable of quite a degree of agility. The evening's orchestral concert, The Great Outdoors, was preceded by solo alphornist William Hopson's presentation about the 2,000-year-old history and folk traditions of the 11-ft. instrument and explained its mechanics.....Hopson's performance of Jean Daetwyler's Concerto for Alphorn and Orchestra was wonderfully expressive. His alphorn possesses a rich variety of tonal colors and his dynamic variation -- from the most blaring fortissimos to the most delicate of pianissimos -- clearly demonstrated the wide range and performance potential of the instrument. About 1,300 music and mountain-lovers fanned out on top of the natural amphitheatre area at the top of the Sunburst lift, looking for a little shade as the hot afternoon sun beat down. The "mountain" music chosen by the orchestra and special guest alphorn-player William Hopson was wonderful, transporting those listening to the shepherd's hilltop refuge at the top of the Swiss Alps, if only in their minds. The powerful sounds filled the surrounding hills easily, rising from the temporarily tented stage area up to those sitting or walking in higher elevations. Hopson, a Calgary musician and well-known alphorn player and maker, introduced the unusual instrument and explained that, although not seen as often in North America, the alphorn has been a mainstay of native music-makers in Europe for more than 2,000 years. He told those "for whom this is their first encounter with an alphorn" that the four-metre wooden horn has traditionally been used by shepherds, watching their flocks in the mountains. "It has an element of the loneliness they must have felt, and also some of the anxiety (being alone on the mountain, surrounded by wild animals)," he said. Playing the alphorn concerto by Daetwyler, Hopson recreated the mystery the shepherds wove through the movement titled "Prayer Song". Used to calm the sheep and settle them for the night, the pure notes from the alphorn resonated through this piece, definitely giving that feeling of relaxation. The other movements: "Herdsman's Dance", "Pastorale", and "Dance of Death" portrayed sounds significant in the lives of the peasants of the mountain villages, using those deep, low notes to create melodies that were not heavy but meaningful. Although the alphorn was originally a solo instrument, Hopson and the KSO built a great partnership, with the unusual alphorn sounds being echoed by horn and strings in the orchestra in one movement, while the alphorn fitted itself in, becoming like an extra section of the orchestra in another. .....The finale, one of Brahms' greatest creations, brought the concert to a magnificent end. It is worth going to the concert to hear the "little treat". This consisted of a brief spot for hornist Bill Hopson, whose devotion to the alphorn permitted the best introduction to the symphony that one could imagine. On April 24, 1998 William Hopson was the featured soloist in a performance of Swiss composer Jean Daetwyler's "Concerto for Alphorn and Orchestra" with the Calgary Philharmonic Orchestra conducted by Bramwell Tovey. He also performed "Alphorn Ballade" by Dennis Armitage in an orchestral arrangement. This concert was in a completely sold out Jack Singer Concert Hall as a part of the CPO's Light Classics series. "I just wanted to let you know how much I and my family enjoyed the concert Saturday night. The variety and quality of music, especially the alphorn, which is not something we can hear often, showed real imagination in planning and programming. .... That was a delightful program." Unfortunately the two newspapers in Calgary did not send a reviewer to the concert, but the good news is that William Hopson will announce performances of the Daetwyler concerto with several symphony orchestras in the near future as a result of his recent success. From September 27 to October 7, 1998 we visited Kazakhstan in Central Asia as a part of a cultural exchange sponsored by Hurricane Hydrocarbons Ltd. and the Calgary Philharmonic Orchestra. Hurricane is a Calgary based company that operates primarily in the Republic of Kazakhstan and this exchange program is a part of their strong commitment to support the communities in which they operate. We performed many times in Almaty, Kyzlorda and Astana (the capital of Kazakhstan), and we made many important contacts with prominent musicians, music pedagogues and business and political leaders.. The highlight was our participation in a gala performance for the President of Kazakhstan in the Congress Hall in Astana. For the occasion, the opening of the new National Academy of Music, many dignitaries were present. Jeff performed Elgar and Bill performed in a trio by Swiss composer Jean Daetwyler on his Alphorn. Other musicians participating in the concert included venerable musicians from the Moscow conservatory, performers on the Dombra (the national instrument of Kazakhstan), and Aiman Musahodzhaeva, an exceptionable lady and the foremost violinist in Kazakhstan. After the concert we participated in a most memorable banquet at the home of Ms. Musahodzhaeva, Also present were the Minister of Culture, the Mayor of Astana and his wife, and leading musicians from the Moscow Conservatory and the National Academy of Music. We were treated to the traditional rounds of vodka toasts and the ceremonial serving of a sheep's head (the national dish) accompanied by unlimited caviar and other culinary delights. The rounds of toasts were an interesting challenge for Canadians, as we realized early on that everyone at the table was expected to deliver an extended and passionate toast to the gathering, and that we were expected to down a glass of vodka to celebrate every effort. Our toasts were well given and well received, but out hosts politely noted that our vodka comsumption was something of a disappointment. The serving of the sheep's head platter was another challenge. It must be accepted as an honour, carved and served with ceremony and dignity, and eaten with as much enthusiasm as can be summoned. Our Kazak friends were partial to the eyes, ears, tongue and brains. Bill found the cheeks and lips to be the most palatable, and Jeff survived the culture shock. The next evening was another important concert with the same participants, but for an audience of musicians from the National Conservatory. Jeff distinguished himself in a Bach concerto and Bill added his self composed Alphorn competition music, "Gargoyle Valley Echoes". By now the Kazakh audience's initial wonderment of the at the sight and sound of the Alphorn was being replaced by wild enthusiasm. Bill was mobbed by Alphorn groupies as he left the concert hall. The party that night was for the musicians; multiple vodka toasts and another sheep's head, but the ceremonial dignity of the previous night gave way to Russian bear hugs and dancing to Asian pop music. Music in Kazakhstan is not for the faint of heart. The next day we traveled to Kyzlorda, the town base of Hurricane's oil production operations. This day was for meeting the beautiful and inquisitive Kazak children, as we performed at the local school at the Hurricane farming operation. The children were wonderful as they danced, sang and played the Dombra for us. That afternoon the feast was held in a yurta (a native mud, stick and hide dwelling) with a ceremonial clinking of vodka filled glasses and the inevitable sheep's head platter. Then we were off to another performance at the Kyzlorda Concert Hall. Bill arranged for the children of Kyzlorda to ring sheep bells as he played his final shepherd song on the Alphorn (knowing full well that children always steal the show). One lovely young lady in traditional costume had a full arm circle ring, and the littlest boy would only give his bell a little shake after great coaxing from his mother in the audience. His shy smile won the audience. Bill played through the distractions, but the finale clearly belonged to the children. The evening closed with a banquet at the University of Kyzlorda (with a final sheep's head), our third performance of the day, and more passionate toasting. The International Horn Society Summit was held June 2-6, 1998 at the Banff Centre for the Arts. The Summit was a wonderful success and a good time was had by all. This was my fourth International Horn Society convention, and this time it was my pleasure to welcome my friends from the IHS to my own territory. The weather in Banff was changeable, as can be expected in Banff in June, but every day offered a some clearing. As a guest artist it was my pleasure to be the first performer on both the opening and closing concerts, and to give a lecture/performance session during the week. The Alphorn Afternoon trip to Lake Louise was a great success for the Alphorn blowers because the echoes were strong, but the postcard view at Lake Louise was hidden in the clouds. It was a great week for Rocky Mountain Alphorns. 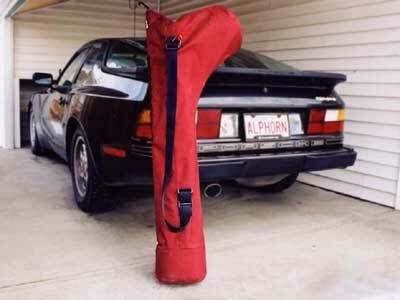 All of the Alphorns that I made in 1998 were sold by midweek, and I have several reservations for my 1999 production. The geographical representation of 1998 sales covered most of North America, including Virginia, Louisiana, Minnesota, Colorado, Oregon and Alberta. Thank you to all of the participants for their dedication and enthusiasm, and to Judy Anderson, Isobel Rolston, Froydis ree Werke, David Hoyt and all of the Banff Centre people for hosting a wonderful Summit! .....I liked the Alphorn because it sounded, sad, happy, and it was really hollow.....Yours truly, Danielle!